Total killer powepop/punk that have been covered by americas the Parasites. The b-side is such a dissapointment concidering the a-side is a first class song. Gary Trainer the man behind Die Trying is still active: Atomic Swindlers Diamond Dreamer. And here’s a fan page from 2001: New Math Fan Page. This is the UK pressing. The US version has a diffrent cover and another track on the flip which shall be as bad as Angela. Released several records after this which aren’t too exciting. Die Trying is a great power pop tune, the only other song that New Math ever recorded that was anything like Die Trying was Hot Sounds which appeared on a local radio station LP in Rochester. As for the rest of the New Math recordings, they were more psychedelic and new wavy sounding and dark in theme. 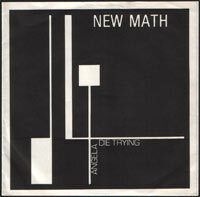 New Math had a chance to hit it big as an 80’s new wave band, but split instead and reformed as the cowpunk group Jet Black Berries. Their music was more like Gram Parsons setting a William S Burroughs western to song. Most of the members of the band are now in The Atomic Swindlers, which is much more of a glam band in the Bowie Ziggy Stardust mode…. Great ep and even greater band. New Math’s repitour is exciting and very diverse, from the powerpop of die trying to the psychotic and all around great they walk amoung you any genre this band crosses is surly done justice. Never a dull moment and never a dull note, New Math’s importance to underground music is felt everyday and has influenced some great bands today like LA’s The War Tapes and female fronted Denver rockers The Nica Teens who’s debut ep includes a cover of They Walk Amoung You. Alright you lot, I am Marlo’s nephew and know Spikey and Stevie White well! I,ve never had the pleasure of hearing any of your songs but would love to! I,ve certainly heard the stories about all the things them lot got up to legendary! I don’t think Spikey has ever recovered if I’m honest! Crack up! I did catch the Perfect Disaster live but because they where getting quite a bit of press from Sounds at the time I think Phil’s Head was swelling a bit, because all us Arlesey lot went over to the Junction in Cambridge and give it we are the Arlesey boys bit and he never really gave us an acknowledgement! But Rise is a crackng song! I’m going over to Menorca in a week or so to see Marlo and know doubt get a repeat of the old days memories which I never tire of hearing about! I,m amazed everyones still alive! I notice you can listen to a song through this site but i’ll be fucked if I can work out how to do it. If anyone knows how let me know please. Respect to the Veins! is a wonder full punk power pop song so lovly so great thank you kbd . Thank YOU sir hake for keeping the site alive with all your comments.